What Happens in 5th Grade Band? During the first week of school all 5th graders observe an instrument demonstration done by the instrumental music teachers. Parent Information Night for 5th Grade Instrumental Music is held each fall to kick off the instrument selection process and inform parents about the elementary instrumental music program. Starting the second week of school the 5th graders are able to try out the band and string instruments through participation in an instrument lab. 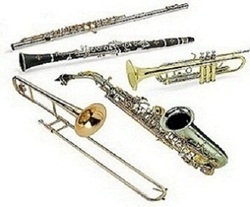 Following the instrument lab each 5th grader will select a favorite instrument to play during the entire school year. The instruments offered in 5th grade include: Flute, Clarinet, Alto Saxophone, Trumpet or Cornet, Trombone, Baritone, Percussion, Violin, Viola, Cello, and String Bass. Shortly after choosing an instrument, the 5th graders will begin having regular band and string classes with their instruments. Basic playing techniques, sound production, and simple songs that use 3 and 4 notes are introduced during these first band and string classes. As the students become more advanced, preparation begins for the winter concert. The first concert is held after winter break to show off the achievement the 5th graders have made since starting to play their instruments in the fall. Both the 5th grade band and orchestra perform at the winter concert. New skills, expanded note ranges, more complex rhythms, and longer musical examples are developed following the winter concert. These new skills equip the students to learn challenging new music performed in the spring concert. The 5th grade bands and orchestras hold separate evening performances in the spring that feature instrumental groups from the Troy middle schools and high schools. Before the end of the school year, the 5th graders show off their musical skills during the day at an assembly performance for their school.